The Partagas Habaneros is an affordable and beautiful everyday cigar of Belvedere format, 39 ring gauge, 4.9” (125mm) long and comes in a box of 25 cigars. Its construction is great and has lots of complexity with aromas of wood, coffee, leather and pepper. The balance of flavor is spot on thanks to sweet notes of caramel and vanilla. 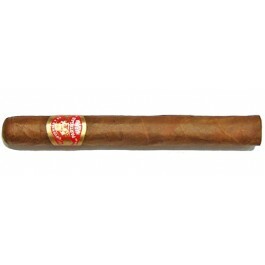 The cigar is mild and never too harsh, between a medium body and a medium to strong body. A great everyday cigar. The Partagas Habaneros is a very good option for a go-to-cigar, which packs lots of flavors while not being too strong. This stogie, now hand rolled since 2007, is a great Partagas that worth a try. The cigar is looking great; it is fully hand-rolled, using a longfiller. It is firm to the touch when squeezed between the fingers. The wrapper smells of tobacco. And the pre-light draw gives some spices, chocolate and floral notes. Once cut, the draw is great, a bit tight, but just enough. It then opens up nicely. When lit, there are instantly some spices on the lips. The first third of the cigar is dominated by spices; there is good hit of pepper and toasted tobacco right from the start. Once the strong spices dissipate, one can taste some darker flavors such as black coffee, leather, and also some earthy and woodsy aromas of cedar. There are also some nutty and sweet toasty notes. Overall, the first third is medium. In the middle third, the peppery flavors are still dominant, there is also a strong taste of tobacco. There also earthy and salty notes, overall pretty dry. But aromas of chocolate and sweet toffee also join the mix, making this third pretty complex while still pretty mild. In the final third, the flavors are even more complex, in addition to tobacco, cedar and coffee, there is now some nice creamy aromas, some sweet vanilla and a kind of spice that one can find in pastries. You do not want to put it down, it is very smooth and pleasant. In summary, this a great medium bodied everyday cigar, full of flavors.